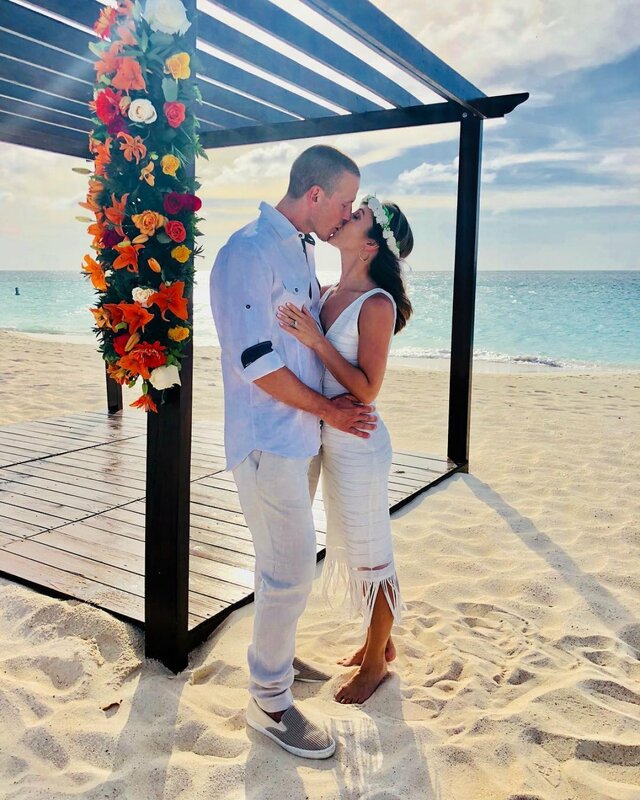 The couple renewed their marriage vows on Eagle Beach in Aruba, with Ashley and JP documenting the special event Wednesday on social media. Ashley wore a tight-fitted white dress with fringe on the bottom as well as a flower crown for the beachfront ceremony. Meanwhile, JP wore a white linen shirt with khaki pants. "We are loving Aruba!" Ashley captioned one image of the pair kissing next to an altar decorated with orange, yellow and white flowers on Instagram. Ashley also posted another photo of the lovebirds enjoying celebratory glasses of champagne. "Renewed and it feels so good!" wrote the former The Bachelorette star. JP also shared on Twitter, "Thanks to our vow renewal, we are good for at least another 5 years!" After Ashley competed on Season 15 of The Bachelor starring Brad Womack, she became The Bachelorette's seventh-season star. Ashley ended up selecting JP over her runner-up, Ben Flajnik, at the Final Rose Ceremony filmed in Fiji. JP proposed marriage to Ashley in the finale that aired in Summer 2011, and then the happy couple got married for a televised special in 2012. The couple welcomed a son, Fordham Rhys, in September 2014, while their daughter, Essex Reese, was born in November 2016. Fans recently watched Ashley and JP confront their relationship issues head-on during a season of Marriage Boot Camp: Reality Stars, but the pair appear to be happier than ever now. Ashley and JP aren't the first couple in Bachelor Nation to renew their vows, as Season 1 The Bachelorette couple, Trista Sutter and Ryan Sutter, renewed their vows back in 2013.